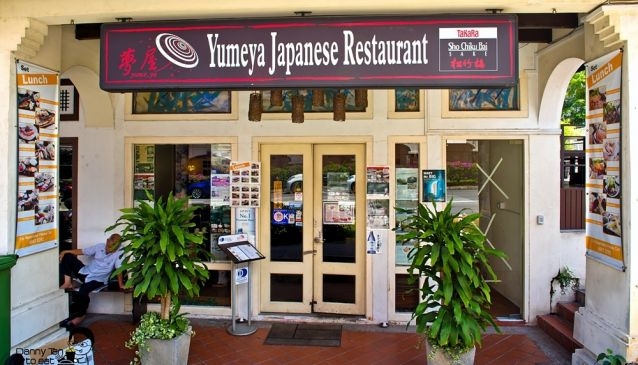 cosy dining space at the corner of Mohammed Sultan Road, Yumeya has established a steady stream of Japanese and local regulars. Headed by talented Chef-Owner Lee Loon, diners can look forward to a fresh assemblage of traditional Japanese delicacies alongside a full selection of fine Japanese sake and shochu. Yumeya is a small intimate space that reminds the traditional Japanese dining houses. Ideal for the sashimi fan, the assorted Sashimi Moriawase platter with its fish freshly imported from various fishing towns of Japan, is a must. While the fabulous sea urchin sashimi will satisfy those in search of a more exotic selection. For a choice option, savour the Chef's culinary craft, the Hotate Mayo Yaki, a piping hot dish of grilled butter scallops and Shimeji mushrooms served on a huge scallop shell with a ring of flames around it. Also try the finely grilled yellowtail called Kama Shioyaki or the traditional Japanese Shake Ochazuke, which is a clear soup with salmon and tea-flavoured rice.